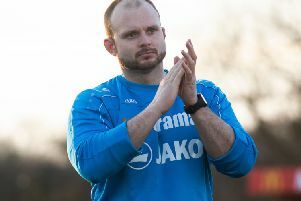 Hemel Hempstead Town manager Dean Brennan has heaped praise on his side after they dug deep to secure a vital 1-0 away win at Concord Rangers on Easter Monday. Hemel went into the game on the back of a disappointing 1-1 draw with Maidenhead United on Saturday, but they responded magnificently to win at Concord and keep themselves in the Conference South playoff race – despite having two men sent off. Brennan was honest in his assessment of the display against Maidenhead, but he was thrilled with the attitude of his young charges against promotion rivals Concord. “First and foremost we didn’t play well on Saturday against Maidenhead, but fair play to them, they are good going forward and they are a decent side,” he said. “We should have held out and it was disappointing to be in the position we were with three or four minutes left, and not to win the game. Hemel knew that a defeat would realistically end their chances of a top-five finish, and Brennan set his side up to have a real go at Concord. “We went there and we bullied them,” said the Tudors boss. “I thought we got it spot on tactically – we played a very attacking 4-2-4 formation which not many mangers would do and we managed the game brilliantly. “To play for an hour with 10 men and then play the last nine minutes with nine men showed the sacrifice and belief we have in such a young side. I was proud to be their manager because I thought they were outstanding. “We had to win the game to keep our challenge to get in the playoffs alive so I was delighted for the players more than anybody. We had to win to keep our challenge to get in the playoffs alive so I was delighted for the players more than anybody. Despite heaping praise on his side, Brennan was less than impressed with the performance of the referee on Monday. “All the elements were against us and the red cards were absolutely farcical,” he said. “It just looks as though there’s something against us. “We’re the best passing team in the league with the best attacking philosophy in the league, with the youngest manager in the league, and it just feels as though everything is going against us. “There was no way in the world that Oshodi has headbutted the guy for his red card, but we have got no video evidence to appeal so it’s very frustrating. “For the Parkes one, the guy has pushed him while he is on the floor, and Parkes gets a yellow for getting up and pulling him by the shirt to stop him doing it. Everyone has seen it. Brennan also acknowledged that his side need to improve their home record, but said that the club must help them to do this by improving the Vauxhall Road pitch as soon as possible. “I think that was our fifth or sixth clean sheet on the road – we’ve got 34 points on the road and 25 at home so that tells its own story,” he added. “People say Concord’s pitch is the worst in the league but it was still 20 times better than ours. “The problems with our pitch need to be addressed and the lack of professionalism needs to be sorted out because the players deserve better. That’s me being totally honest – I can’t be any more blunt than that. “We haven’t had a clean sheet in 18 games at home. It’s embarrassing. The players have to take responsibility, I have to take responsibility as the manager, but so does the football club because there are too many excuses.